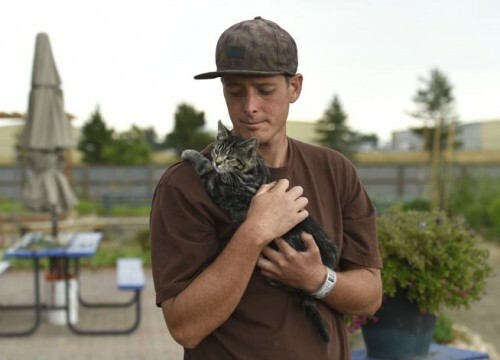 Cats Help Inmates Patrol Garden at Boulder County Jail! There have been numerous stories about how dogs have helped inmates during their rehabilitation in jail. Well, cats are now doing the same by helping with the gardening at the Boulder County Jail! The rescue cats patrol the gardens and help by hunting mice and scare away rabbits at the jail’s organic garden. Two rescue cats, Charlie and Adra replaced Sarge, another cat, who patrolled the garden and pretty much the entire jail grounds and surrounding area for many years. Sarge’s initial replacement, Asher, didn’t take to jail life and ran off, but, so far, the new cats seem to like it. Sarge unfortunately died and the inmates set up a memorial plot at the front of the garden that bears his name. Someone hung a rosary on it. The cats are a perennial favorite among the rotating inmates. The effect the cats have been on the inmates has been pretty profound. One inmate got in trouble and couldn’t work in the garden. He kept asking about the cat. He didn’t care about anything else. He loved gardening, but liked the cats even more. Working in the garden is a privilege for the inmates. Apparently, working in the garden is a privilege for the inmates lucky enough to get picked for the job. A spot in the jail garden crew is highly coveted among inmates. About four people get to do it full time among a daily population above 500 inmates. The inmates work upward of 12 hours a day and receive instruction from master gardeners who volunteer their time and expertise. One inmate walks around the garden, rattling off a list of vegetables and plants he’s become acquainted with — Armenian cucumbers, tomatillos, cabbage, Brussels sprouts, Jerusalem artichokes, watermelon and a dozen others. The garden yielded about 13,000 pounds of produce last year and this year will likely produce more than 20,000 pounds. Inmates are cultivating more of the grounds, and volunteers have started planting flowers. Some of the inmates installed a fountain and stone work, and the jail recently received permission to build a greenhouse on an area currently flush with tomatillos. Inmates will use it to sprout seeds, something currently done at an outside nursery. The inmates are proud of the vegetables they have produced and have really taken to the cats who help with the garden. It’s another way for inmates to have an emotional connection while reaping the rewards of the gardening that they have done. Story credit ; Boulder County News and photo credit Jeremy Papasso, Staff Photographer.